We don’t get many anime-themed games but if we do get them, we sure dive straight to it and get it as soon as possible, especially if it has “Jump” in its title. 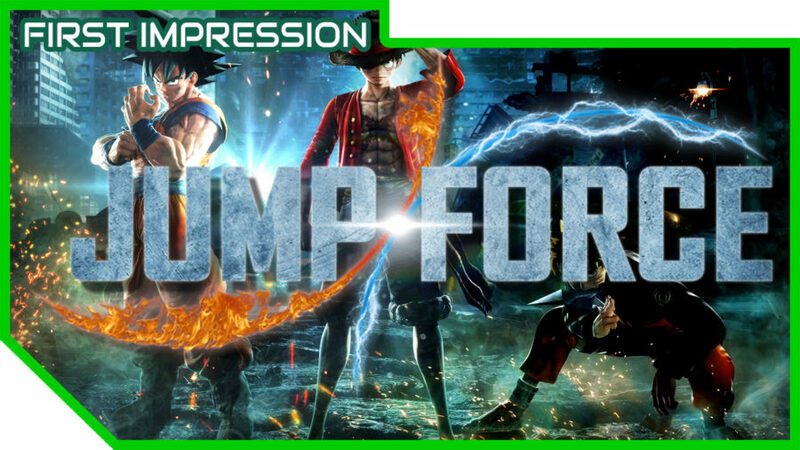 I am indeed talking about Jump Force – a highly anticipated game since its announcement on E3 last 2018. I mean, why wouldn’t you be hyped for a new anime game – no, I think the real question is, why wouldn’t you be hyped for a new Jump game, right? This is JJ of The Gamers Camp bringing you my first impression of Jump Force. Jump Force is an anime arena fighting game developed by Spike Chunsoft and published by Bandai Namco. You might ask, “a fighting game, huh?”. That is right. Though this is a fighting game, this is not of a traditional one. This kind of fighting game has its own subgenre in the genre, so to say; Anime arena fighting. Some games in this genre include the recently released My Hero One’s Justice, Naruto Ultimate Ninja Storm series, Dragon ball Xenoverse, and the not-released-yet KILL la KILL IF. Compared to traditional fighting games like Tekken, Dragon ball FighterZ, Street Fighter, BlazBlue Cross Tag Battle and the likes, these games are different. Aside from the fact that you have the entire stage to roam around to, the mechanics and fundamentals are different. Some people, however, call these kinds of games “brain dead” as you can play with just button mashing, which I agree to some point, but competitive-wise, I think it can bring more than just button mashing – Heck, there’s even Naruto Shippuden Ultimate Ninja Storm tournaments. When the game got first announced, I’ll be honest, I was very skeptical. I didn’t like it how it looked because for me, it looks very unpolished. Additionally, it looks like some indie Unreal Engine 4 game – no offense to indie developers. 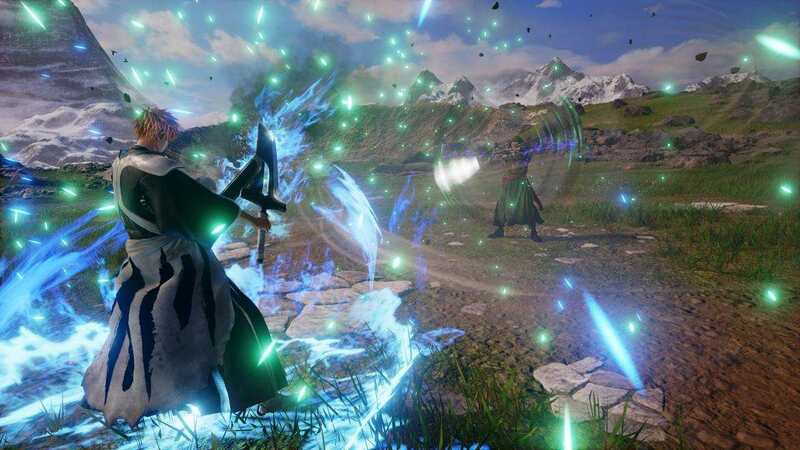 But hey, some of those indie Unreal Engine 4 has better looks than Jump Force’s for me. Despite saying all those, I’ll say that Jump came from a long way to get to this level, so I guess it got a graphical upgrade, though I think it could use some more polishing. If we can get a new Jump game using those sprites just like back in Jump Ultimate Stars, I would pick it up immediately since I really prefer those 2D Fighting game using smooth transitioning sprites. However, when I get into playing the game, I felt the “eh, why not?” feeling; the feeling when you’ll just ignore your doubts about the game from your first impression just for the benefit of the doubt and I’m glad that I did. I noticed how they took care of the graphics of the game; the game’s in high definition, almost aiming for that realistic look which I think it successfully achieved and, man, those particles coming out from every attack making the game look more intense than it already looks. Even with all the particles from each attack, which I think should slow down the game, the game was able to render it without slowing down so I think that is a big thumbs up! What I didn’t like about the game’s graphical delivery is the animation. I feel like it animates awkwardly – the way it stops then proceeds to another in every attack, that is something I’m not a fan of. KILL la KILL IF also has this kind of attack animation. Lastly, I still think they need to polish the characters aesthetics, I mean just look at this. Oh, one more thing – For those who aren’t fans of non-60FPS games, however, I have some bad news – the game only runs at 30FPS but consistently. Comes from the announcement of Bandai Namco, the beta demo comes with 17 characters and for a demo, I think having 17 characters is both good and bad. Good, since we’re getting a treat by being able to play with a variety of characters. Bad because, well it’s a “demo”. Before I got to get into the servers and play, I had to patiently keep on retrying on entering the servers for 1 hour and 40 minutes. I guess that’s already something I should’ve expected given that this is an open beta demo. Upon entering the server, the first thing I noticed is the environment. The “lobby” will surely give you flashbacks of your first-time playing Dragon ball Xenoverse Exploring the area, however, will give you much of a second thought. Though the area on Jump Force is like Dragon Ball Xenoverse’s, it is not as worse as Xenoverse’s and is smaller than the other, making the NPCs easier to access. Of course, this is just a beta test so not all NPCs are accessible and will only give you the following message, “This functionality is unavailable during the beta test. Please wait for the full release.“ There’s one NPC that you can access and talk to and it’s the ONLINE MATCHES NPC. This NPC only gives you two options: Vs CPU and Matchmaking. Vs CPU, just like its name, you can battle CPUs on an offline battle here, which is weird since you must connect online to battle offline, but then again, the purpose of the online beta is to see how much they can stress the online servers. On the other hand, Matchmaking is the option to battle people online. Battle-wise, just like many fighting games, it looks like a rock-paper-scissors game. Blocking negates normal attacks and specials, Grabbing is possible to opponents who are blocking, and Attacking normally or with specials negates grabs. The things to take note of the game are, I might be missing some but here are the things that are most worth nothing, you are in a battling with a team of 3 characters consisting of your selection from the variety of characters available in the game, you can do awakenings which can buff your character when your awakening gauge is at least half full, there’s another gauge responsible for indicating the number of support attacks and another for dash escapes. Lastly, this game, just like Ultimate Ninja Storm Series, has all your characters in your team share the Super Gauge and Health Gauge. The online connectivity, though. I can say it’s kinda perfect. Matchmaking is fast and there’s an unnoticeable delay from when you are battling someone online. I hope it would stay the same when the full version of the game comes out. Those things that I’ve said may be an upside or a downside for the game, but they depend on you if you like it or not. That pretty much sums up everything about my first impression of Jump Force, at least of the beta. If I am going to be asked, “Is this game worth buying?” I would say, if you’re an anime fan or just fan of fighting party games, this is a great treat. Otherwise, I think you’ll just be wasting your money. It all goes down to how you’ll take the aesthetics of the game, I have already laid it out for you. Personally, however, I’m still on a 50-50 edge on this game. A few more online matches may change my mind, for the better or worse. Did you guys like my first impression of Jump Force? If you did, make sure you share the article for more of these and let us know in the comments of your first impressions/opinions about the game! Don’t forget to also check out my Facebook page where constantly go live playing games and my YouTube channel where I upload my stream highlights.